After doing the blog post on water purification systems and Phytodepuration and the benefits of several plants. I thought this was a good time to step back and talk about plants ecology and one in particular, the Prickly Pear.“Green gold”, “fruit for the poor,” “treasure under its spines,” “world vegetable dromedary,” “future plant,” “sacred plant” and “monster tree” are all nicknames for this cactus. Why so many nicknames for a plant that a lot of people have never heard of? Why do I refer to this plant as a Miracle food? I do because this plant can feed millions and millions of the most vulnerable people and animals. People in areas of the Middle East and in Africa that have the driest, most arid climates, the ones most affected and challenged by climate change. In Ethiopia, this is one of the only plants that they can depend on to flourish. Additionally, in Italy this plant can yield 20-30 tonnes/ha. I grow Prickly Pear personally and incorporate them into my design with vetiver grass to help fight soil erosion at the World Permaculture Association home office The Urban Permaculture Laboratory. Additionally, in a lot of my consultations because they have many benefits as well as the ability to be a living fence and many other features. The importance of Permaculture and reaching a tipping point of where more people are practicing Permaculture than Industrial Farming is extremely crucial, this is OUR LAST CHANCE. The expansion of mono-cropping more in particular “cereal cropping” has caused massive wind erosion and a massive decline of soil fertility. As always a thorough understanding and awareness of the environment within your design is paramount. Additionally, knowledge on designing and managing an orchard along with the fertility, fruit growth, and ripening is vital. Your orchard design will vary on a multiple of things such as farm size, farm management, implements, climate, soil fertility, cultivar growth habit, plant training system and occurrence of pests. Please be aware of the best results contact a Permaculture Consultant or Attend a Permaculture Design Course. Prolonged droughts and continuation of desertification are going to get worse and worse for all of us as our population rises and endless cycles of misuse of our natural resources continue. Even throughout all of our damage to the earth, the Prickly Pear can still thrive in these dry conditions. Adapted perennial crops with greater productivity per unit area are required to protect our land from further degradation and soil erosion. The water that this cacti stores within itself can fight against drought and wildfires. Cactus pear can function, not only as a water reserve but as a carbon reservoir in arid and semi-arid regions, where the climate is more erratic (1). Getting more water through the plant to the soil increases the fertility of the soil. Prickly pear not only fights against soil erosion, wind erosion, wildfires, drought but also edible for animals and us. They are a succulent and drought-tolerant species, that can produce > 20 tonnes DM ha−1 year−1 and provide 180 tonnes ha−1 year−1 of water stored in its cladodes, representing a cost-effective option for livestock watering (1). Prickly pear and other cacti can also improve the nutrition intake on livestock that mainly survives on straw-based diets because of the soluble carbohydrates within the cacti. Also great for milk production and weight gain in heifers. This miracle food is one of the answers to ending world hunger! Let’s now talk about the nutritional benefits for us! 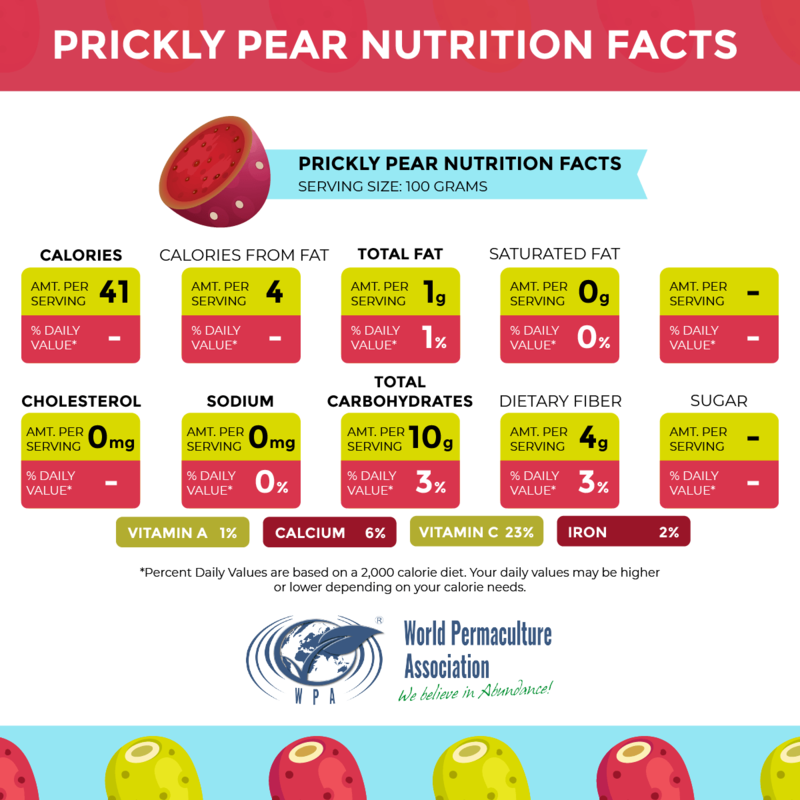 Prickly Pear has high potassium content, and low sodium content offers clear nutritional benefits for people with kidney problems and hypertension (1). Additionally, cactus pear is high in calcium. This miracle food also has antiviral, anti-inflammatory and anti-clotting properties to improve a lot of medical conditions (2). Let me also mention that prickly pear is high-fiber, rich in antioxidants, carotenoids and linoleic acid (an essential fatty acid) and contains minerals like calcium, potassium, magnesium, and phosphorus (2). There are different edible parts of the prickly pear. The pad of the cactus, called nopal, can be used as a vegetable. The flower petals can be in salads. The pear, which is like any other fruit (3). Which makes this miracle food to be so versatile to be a fruit and a vegetable. If the prickly pear is ripe, it will yield to gentle pressure. They should be harvested (or bought) small, smooth, flawless and deep-colored (2). Avoiding the hard, moldy, broken or blemished produce. Please be aware and cautious it is very sharp, and the prickles can cut you. To properly prepare and eat the prickly pear you will need something to protect your hands and a sharp knife. In the video, I demonstrate cutting the Prickly Pear without gloves. I needed to protect my hands. I used what I had available and transformed the waste into an essential tool. Consequently, a lot of people do also suggest using pliers to pull out the prickles of the fruit. I used the plastic to protect my hands from the prickles. I don’t find the pliers are necessary, however, whichever way you feel most comfortable preparing is fine. The Prickly Pear is very sweet! There are a lot of recipes using the Prickly pear in smoothies, juices and, jellies. Please be careful if you are purchasing prepared prickly pear products look at the packaged nutrition value. Pay close attention to the added ingredients and the sugar amounts. Additionally please support the local organic or biodynamic farmer if that option is available! Prickly pear being able to grow in the harsh climates gives us that one more food source. Having an ever growing population, permaculture teaches us to look outside the box. We need to make a change for our future and for future generations. Let’s use our natural resources for everything that earth has intended. We need to make a change in the mono-cropping, industrialized chemical farming that has become the norm. This article was first published on the World Permaculture Association’s website. Odd he doesn’t even mention the food value of the pads themselves–except as fodder for animals. Hasn’t he ever had nopales? For Australians reading this article, be aware that it is referring to (mainly) Opuntia ficus indica and not to the dreaded Opuntia stricta which took over large parts of Australia in the past, having no indigenous predators. O. ficus indica can be legally grown in all states except WA. Excellent info on cultivating the prickly pear. Also enjoyed your November 2013 article on the majestic bountiful Bunya Pine (Araucaria Bidwillii) which along with its ancient relative the hardy Chilean Pine (Araucaria Araucania – aka monkey puzzle tree) maybe we should be planting more of now for the warmer world in the years ahead. In South and Central Texas prickly pear is a nuisance plant to some. One way farmers and ranchers manage the cactus is to burn to spines off with a pear burner. Once the spines are burned off the cattle can come in a eat the cactus without injury. Fire is also how we get rid of the spines when harvesting a large crop for our own consumption. After picking the fruits we place them over an open flame for just couple seconds in a wire basket. Britt: In West Texas, they run a torch over the cactus to scorch off the spines, then run. Cattle, horses, sheep and goats, rabbits, quail and all will mob you trying to get to them, that’s how much they like nopal (prickly pear. Wild pigs will eat it thorns and all, and so will most wild animals. They’re bland to us humans, but good eating if cooked a little. when the leaves are half-grown, the old ones (Native Americans) cleaned off the spines over a fire, then cleaned and cut into strips (nopalitos, tender cactus). This was layered with some salt to pickle them, but they’re good cooked, as well. Niio! Britt: In West Texas, they run a torch over the cactus to scorch off the spines, then run. Cattle, horses, sheep and goats, rabbits, quail and all will mob you trying to get to them, that’s how much they like nopal (prickly pear). Wild pigs will eat it thorns and all, and so will most wild animals. Pads are bland to us humans, but good eating if cooked a little. when the leaves are half-grown, the old ones (Native Americans) cleaned off the spines over a fire, then cleaned and cut into strips (nopalitos, tender cactus). This was layered with some salt to pickle them, but they’re good cooked, as well. Niio! I was seeking information for the prickly pear and came across the blog. Great share.